The 2019 Kookaburras will play the Ohio Valley River Rats for the first time in a home and away series. Also on the 2019 schedule is a game versus our old rivals the North Carolina Tigers to kick off the season and a new kid on the block Savannah. The Kookaburras will travel to Savannah late June with men's and women's teams in their plans to expand the teams in Georgia. With games v Rome GA like in 2018, the Kookaburras schedule shows shorter travel distances and an emphasis on regional development. Exciting news as well added to that is the Women Kookaburras are back in 2019. 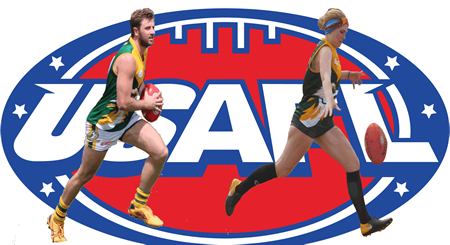 The Kookaburras women's team last played as a group in 2010 at the USAFL Nationals joined up with Sacramento, in what was the first Nationals appearance of the Sacramento Suns Women's team. The early Women's Kookaburras were 3 time National Champions and are looking to get back to that standard in as short a time as possible. The Kookaburras and it's new women's team for 2019, are excited to help the fantastic growth of women's footy in the USA and around Georgia in 2019. The Kookaburras men's team look to continue their journey back to Division 1 of the USAFL. 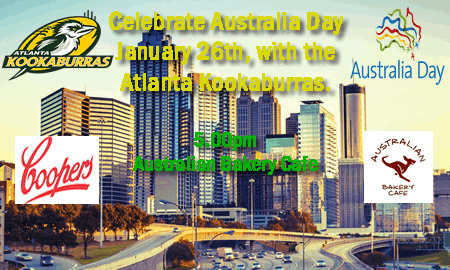 The Kookaburras are joining with our friends at the Australian Bakery Cafe in downtown Marietta January 26th from 5.00pm to celebrate Australia Day. This is a private event, so RSVPs are critical for attendance so everyone going gets taken care of by our great hosts, Nev, Mark and Wendy. So here are the traditional Australia Day Aussie food options,...they are all great! Byo "special" beverages " Thats right is its the ole BYO booze...the Kookas will have some Coopers Pale Ale to try if you forget. Parking: $5 County Multideck, access via Waddell St off Roswell Rd, this park is credit card only. Huge congratulations to Braden Medders who took out the coveted Atlanta Kookaburras MVP - Mike Powers Medal this past Friday night. In a close finish Braden picked up 47 votes to just hang on in front of last years winner Ryan Downey who was Runner-Up MVP. Braden Medders first played in 2010 in the local AARFL Metro competition before debuting against Nashville and since that time has been a rock in the backline. Normally you can see him at Full Back where he has solidified that role as his own for the Kookaburras for many years. Recruited by the one and only big Dave Evans, Braden has established himself as an important part of the Kookaburras success over many many years playing 80 Kookaburras games and countless local and social games. 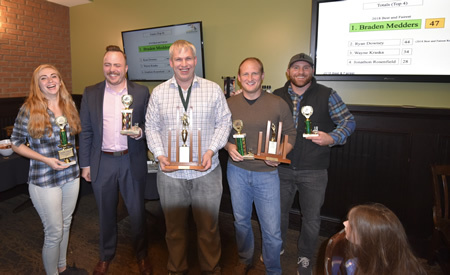 Leading Goalkicker Award was won by Tom Gultom and awards were also given out to players for the 2018 AFLS leagues, the Atlanta Social Aussie Footy competitions. Shaunna Chamlee won that award for the women and Ben Kora for the men's competitions respectively. 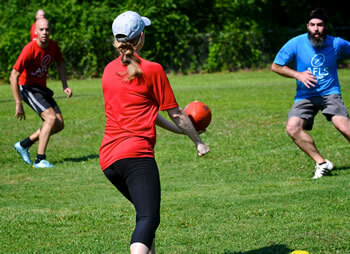 Both Shaunna and Ben were also new players to the organization this year and showed AFLS is a great way to introduce new players to the sport and broaden the awareness of the game of Aussie Rules football to the wider Atlanta sporting landscape. Congratulations to all winners. You can see more photos on our Facebook or Instagram sites coming soon. 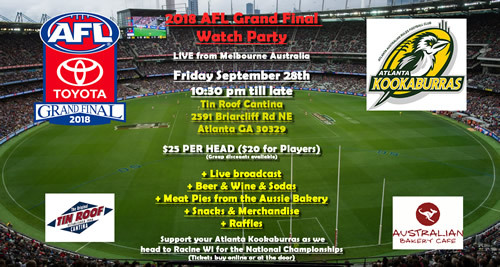 The Atlanta Kookaburras are pleased again to be hosted by the Tin Roof Cantina for our Atlanta AFL Grand Final Watch Party on Friday night September 28th. On offer great meat pies from the Australian Bakery Cafe. $25 gets you drinks all night (beer and wine), eats, contests and of course the live coverage from Melbourne Australia starting around midnight. We are requesting everyone pre-purchase tickets here as we have capacity limit for this event and to help with catering. Either way tickets available at the door and don't forget to RSVP also on our Facebook event page here. We look forward to seeing you there and a great game. The event commences around 10.30 pm Tin Roof Cantina 2591 Briarcliff Rd NE Atlanta GA 30329 MAP IT HERE. 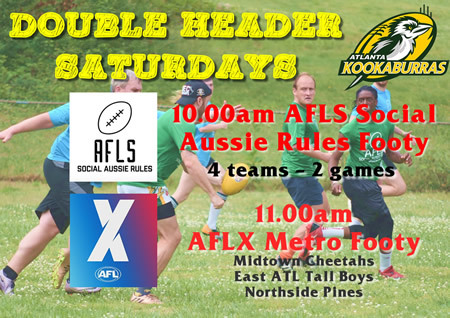 The Atlanta Kookaburras invite you to start the New Year with something fun and active, by coming down to try out Social Coed Aussie Rules Football. 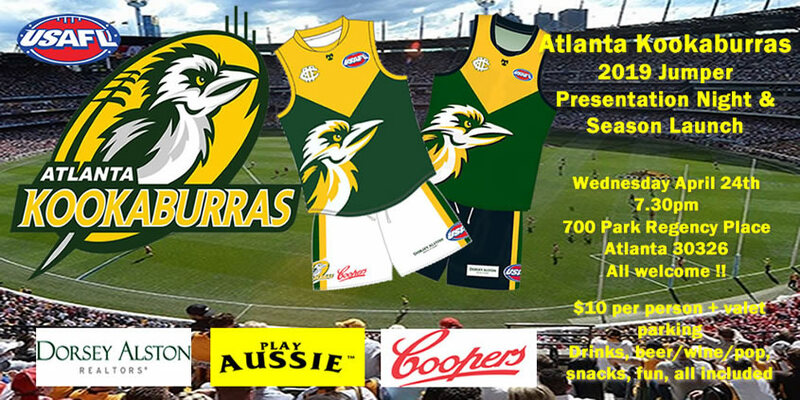 After a great 2018 season of games held throughout the year, the Kookaburras will be continuing to grow this great version of Australian Rules Football around Atlanta. This week games recommence at Grant Park just outside of Atlanta and you can come down and try out the game for free with no obligation. If you decide to join up you will receive coaching, a 6 game season, a team T shirt, and like everyone else be able to meet a whole new bunch of fun, active, interesting people. The game is also open to anyone, males, females, everyone from 12 years to 120 years can play this game, being a totally non tackle, non contact version of Aussie Rules Football. You can trust this game is 100% safe.